CWRU offers various opportunities to get involved with tutoring and mentoring elementary, middle and high school students in the Cleveland area. Below is a summary of four different ways to get involved as well as other resources that can connect students to youth populations. This award-winning volunteer tutoring and mentoring program was founded in 1988. The program uses the talents of undergraduate, graduate, and professional school students from CWRU to provide tutoring and mentoring services to youth that attend Cleveland public schools. The program invites both volunteer and work-study students from CWRU to serve throughout the year. This program requires at least one semester of commitment. For more information, contact Janice Eatman Williams. The Church of the Covenant hosts the Saturday Tutoring Program on Saturdays from 10 a.m. to noon in the fall and spring semester to provide area youth between ages 6-17 with tutoring and academic support. Student volunteers are always needed. No long-term commitment is required, but first-time tutors must attend an orientation prior to their tutoring sessions. Orientations are held at 9:15 a.m. at the Church of the Covenant (11205 Euclid Avenue) each Saturday, prior to the tutoring session. For more information or to begin tutoring with this program, contact Linda Wilson. CCEL Serves: Semester Serves is designed to offer CWRU students weekly opportunities to get involved in community service. Semester Serves volunteers commit to at least one semester of service with a nonprofit organization, and go each week as a group to that site. Student leaders help coordinate the group and also provide transportation to the site through the CCEL vans. Several Semester Serves sites involve tutoring and mentoring, including the Boys and Girls Club, Lake Erie Ink, and Esperanza. For more information about joining a Semester Serves site, contact the Center for Civic Engagement and Leaning. CCEL has a partnership with Big Brothers Big Sisters of Greater Cleveland. Through this program, CWRU students are matched as "Bigs" with local middle school student "Littles." Bigs and Littles meet on campus every Monday afternoon from 3:30 to 5 p.m for tutoring and mentoring sessions. Bigs must commit to at least one academic year with the program, and spots are limited. For more information, contact McKenzie Fridrich. 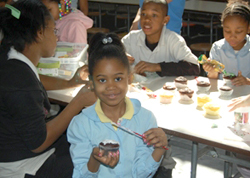 Many nonprofit organizations in Cleveland work in the fields of youth development and youth education. For a full listing of community organizations that work with children and youth, contact the Center for Civic Engagement and Leaning.